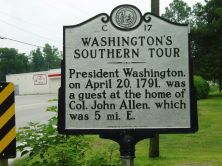 President Washington, on April 20, 1791, was a guest at the home of Col. John Allen, which was 5 mi. 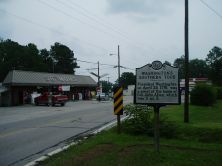 E.
After a night in Pitt County, Washington left the morning of April 20 headed toward the colonial capital of New Bern. Throughout his tour of the United States, Washington had made it a policy to only prevail upon inn and tavern keepers and not to spend nights and meals in private homes. However, after leaving Shadrach Allen’s inn en route to New Bern, Washington arrived at the home of Colonel John Allen for breakfast. 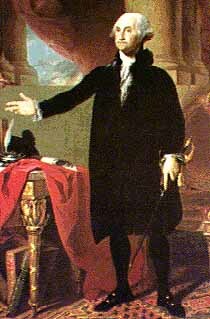 Washington believed that Allen’s home was an inn. The mistake was not discovered until after Col. Allen’s wife, unprepared for Washington’s visit, produced a lavish meal in short order. Washington rested his horses at the Allen home briefly before continuing his travels to New Bern.